Have a Davin James concert in your home! Share an amazing musical experience with your friends, family or co-workers by inviting Davin to perform at your home. House concerts are up-close and personal acoustic performances and one of Davin’s favorite types of shows. 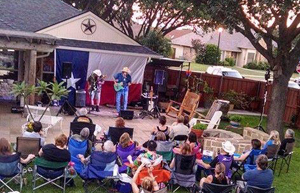 Many people consider house concerts to be their favorite way to hear their favorite performers. Davin enjoys telling stories and singing his original songs. This is a unique listening experience.